This aircraft was formerly “Lucky Lady” which following years of ownership and legal disputes had been sitting out in the open in a neglected state and missing an engine in Virginia, USA since 1999, until sold in 2014 on eBay (it had been regularly flying in the 1960’s and 1980’s to 1990’s but was in poor condition and grounded by 1999)! 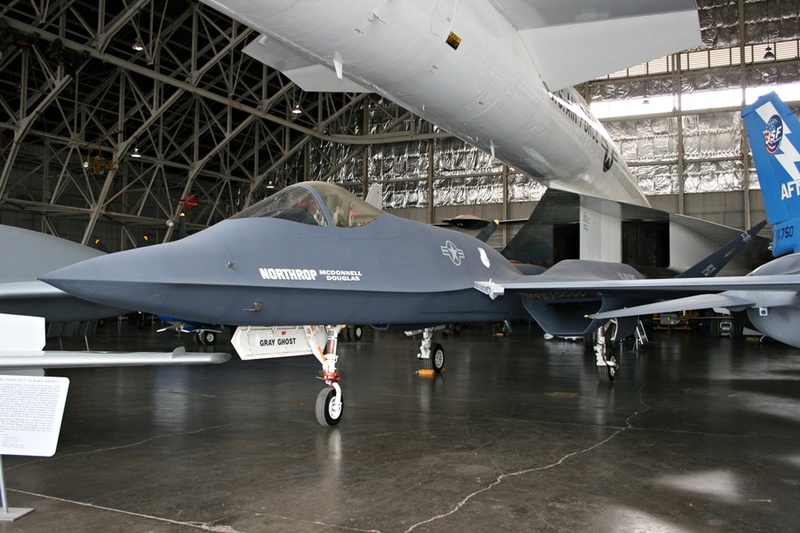 The new owner just wanted it for some parts and Reevers who had missed out on the original sale were contacted and purchased the remaining airframe in 2015 and had it shipped to Australia. 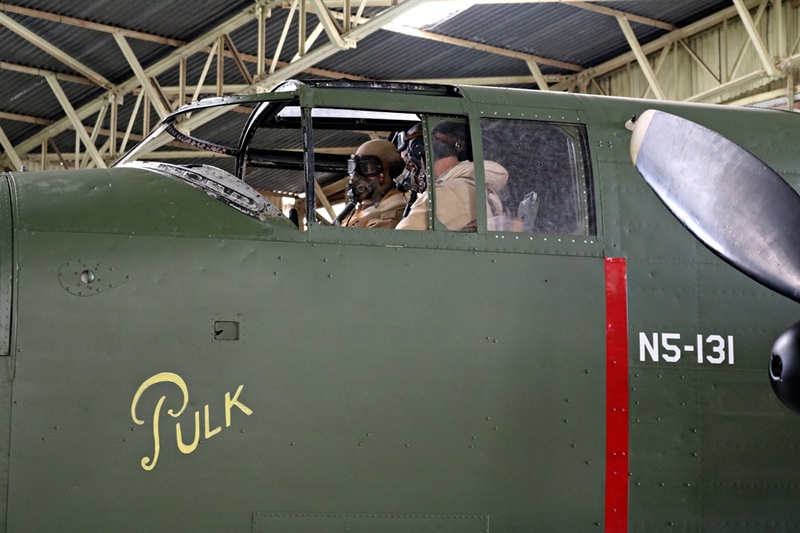 Now the B-25J (s/n 44-31508) has been painted as “Pulk” (which was originally N5-131 a B-25C – the first mass-produced B-25 version) from No. 18 (NEI) Squadron – a Netherlands East Indies / RAAF composite squadron. 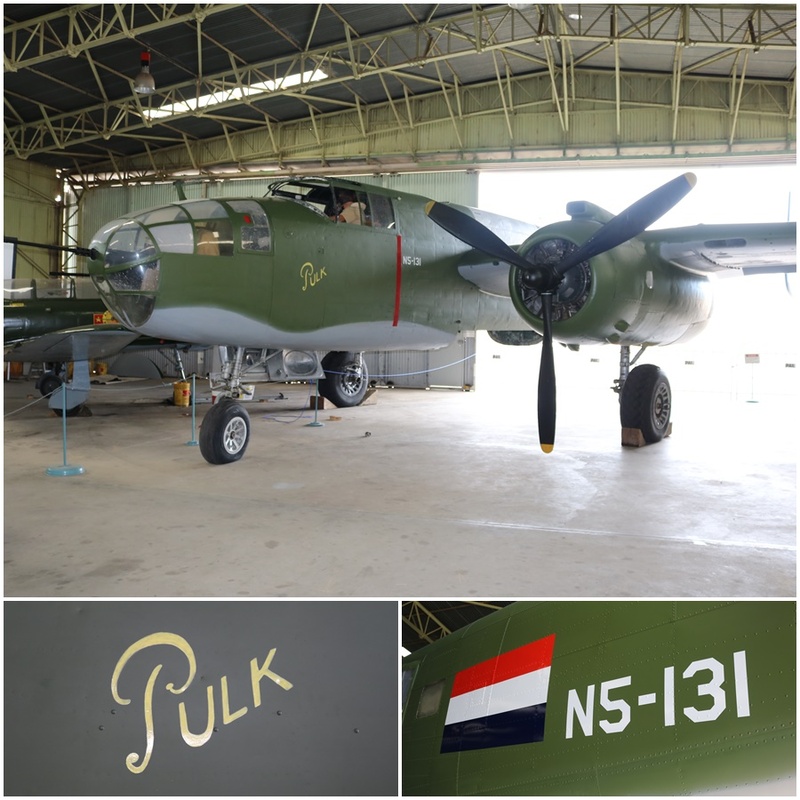 The original “Pulk” was named after the B-25’s Dutch pilot, Fred “Pulk” Pelder (he apparently was given that nickname due to his tinkering with mechanical devices to improve performance) and it would serve the Dutch until its retirement in March 1948. Personnel and aircrew of No. 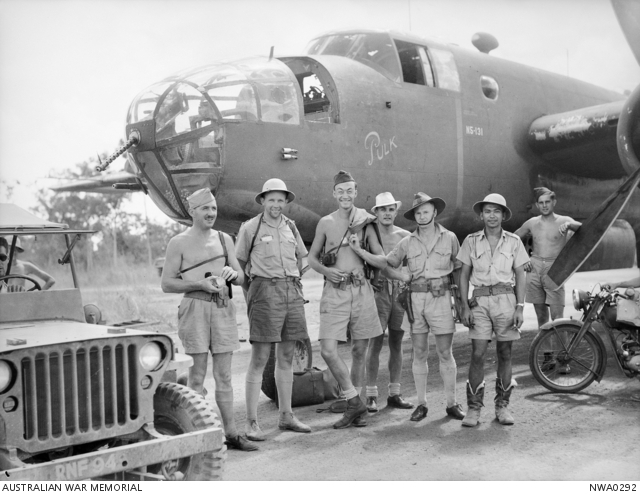 18 Squadron, Netherlands East Indies (NEI), RAAF, in front of their North American B-25 Mitchell bomber, (aircraft number N5-131), named “Pulk”, after returning from a raid against the Japanese – May 4th, 1943. Also visible is a quarter ton truck, Jeep and a small motorcycle. (Photo Source: Australian War Memorial) – the smile on the dial of the man in the middle is priceless! 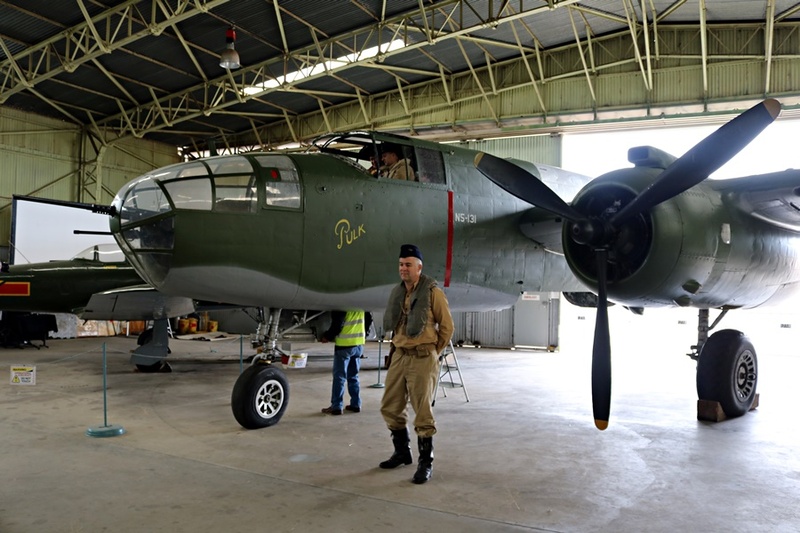 The long-term plan of Reevers Warbirds is to restore the B-25J to flying status and honour the personnel of No.18 (NEI) Squadron. 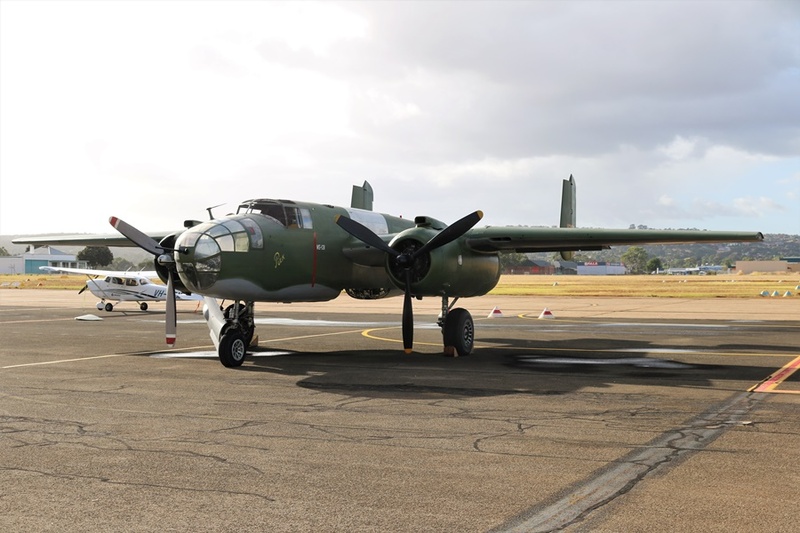 This will be great as there hasn’t been a flying B-25 in Australia since the 1980’s (as far as I know)! 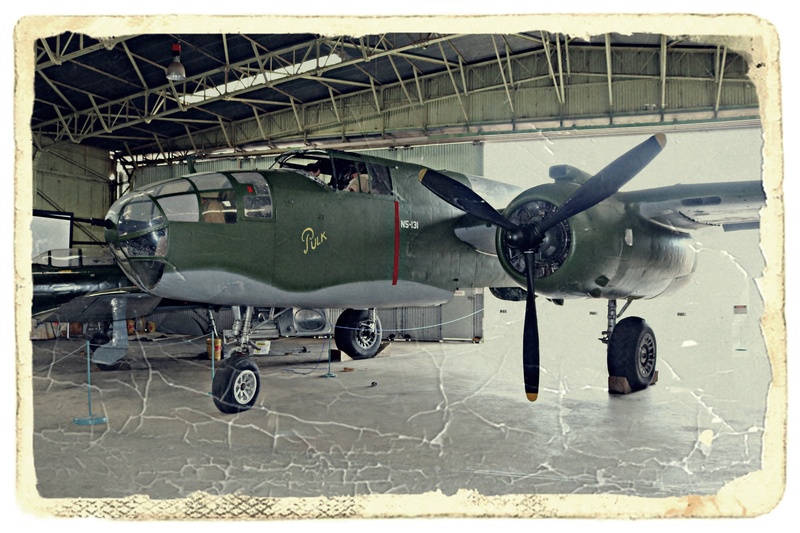 Back then a B-25J was purchased by Aero Heritage Inc. from a United States owner in 1983 and was flown at air shows in Australia (Constructors Number 108-47545, USAAF serial number 44-86791 – built 1945, post war it was put into storage in the late 1950’s, until used in the 1960’s as an aerial tanker for firefighting in Alaska, it then headed for California for movie and TV work in the 1970’s before ending up at Paine Field, WA in 1982). 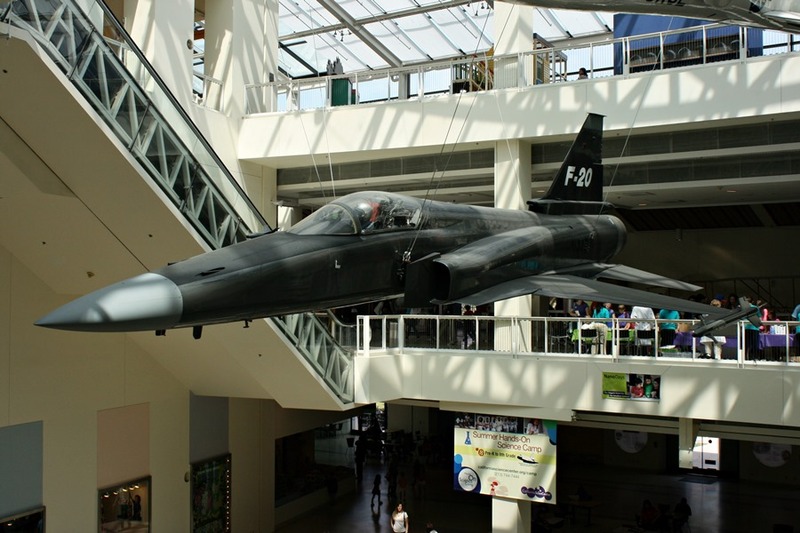 I only ever personally saw it fly at the Ballarat Air Show in 1985 but it ended up being sold to the Australian War Memorial and unfortunately grounded and put in storage. 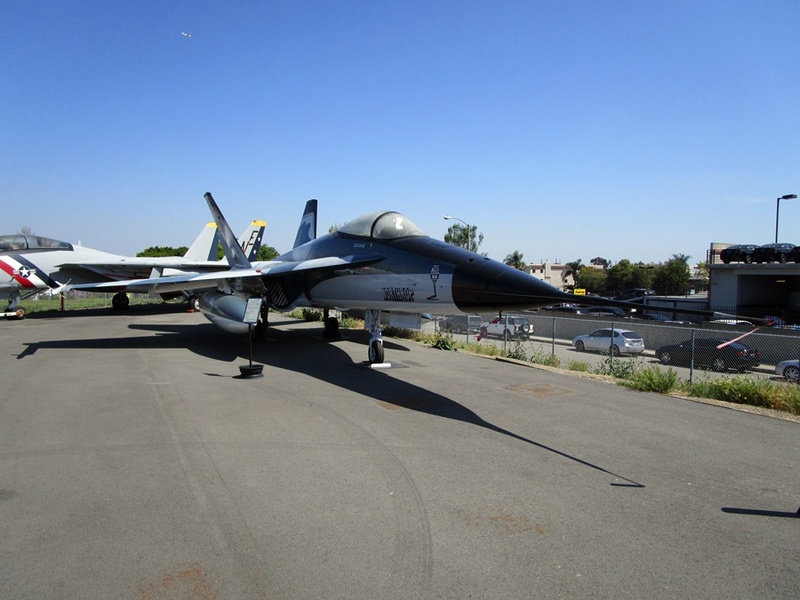 They sold it in 1996 as it had no historical value to Australia and it ended up going to an overseas buyer (despite the outcry of potential local warbird owners) and since 1999 has been on display at the Yanks Air Museum in Chino, California, where in 2013 I saw it looking in very good condition much as I remembered it back in the 1980’s. 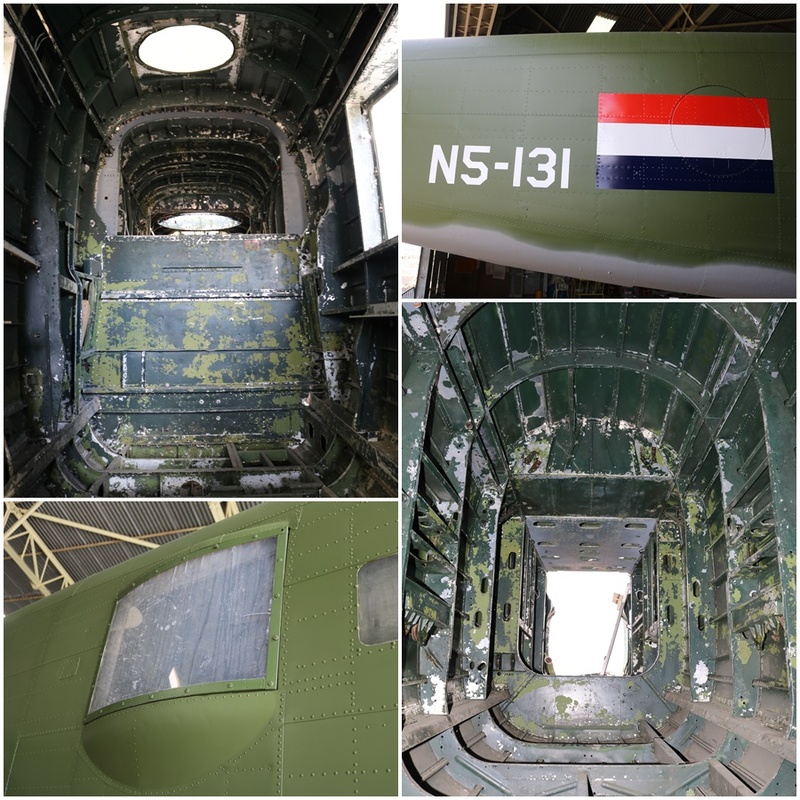 Now the Reevers B-25J may currently look like a lot of restoration work has been done (which there has been) but there is still a very long way to go before it is flying again and much of the aircraft remains an empty shell. 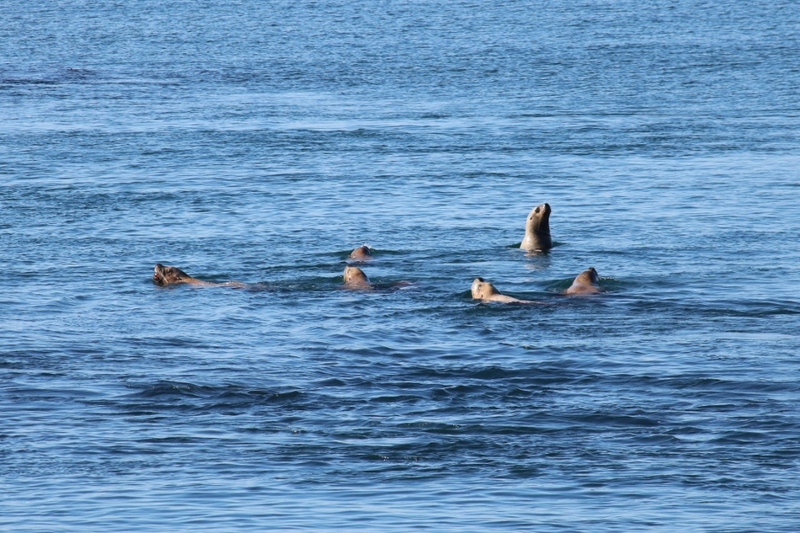 They continue to source parts and receive donations from around the traps to complete the restoration. 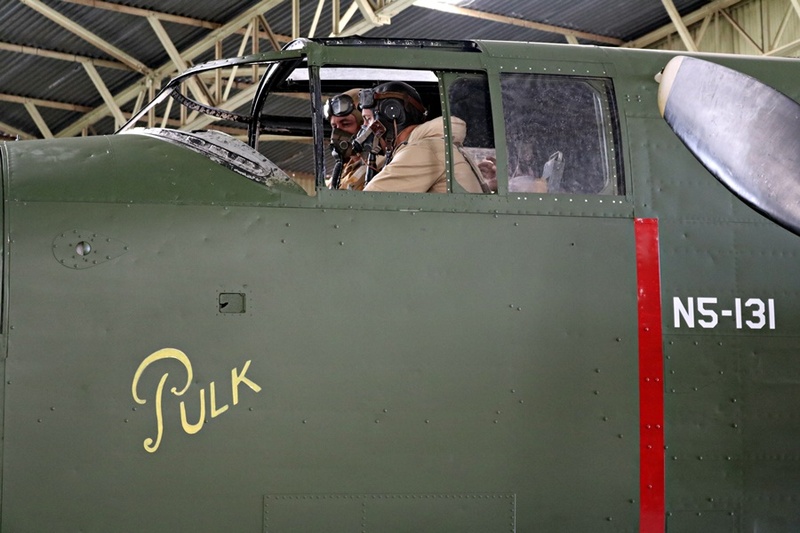 The fresh coat of paint and NEI “Pulk” markings was done for a special invite only event the day before I saw the aircraft, for veterans of No.18 (NEI) Squadron on its 75th anniversary. Colonel Harold Jacobs of the Royal Netherlands Army who is the Defence Attache for Australia and New Zealand was present as was the son of Fred “Pulk” Pelder. 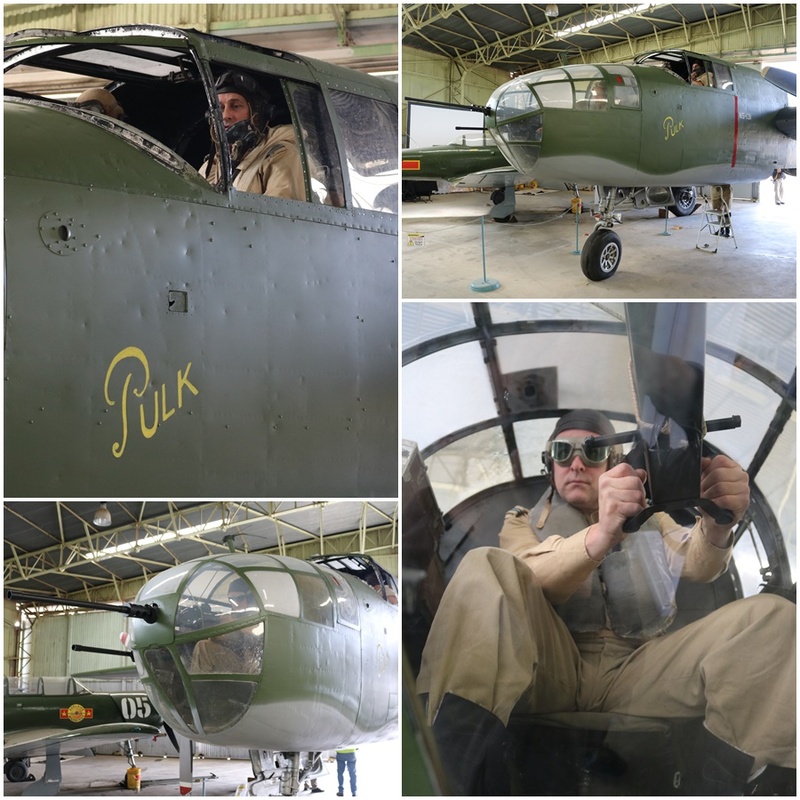 A surviving pilot from No. 18 (NEI) Squadron, Hans de Vries and the son of Fred Pelder (in respect to his fathers service) were presented with service medals from the Netherlands. On April 9th military reenactors from the Wartime Living History Association Inc. based in Melbourne were present in Dutch uniforms. 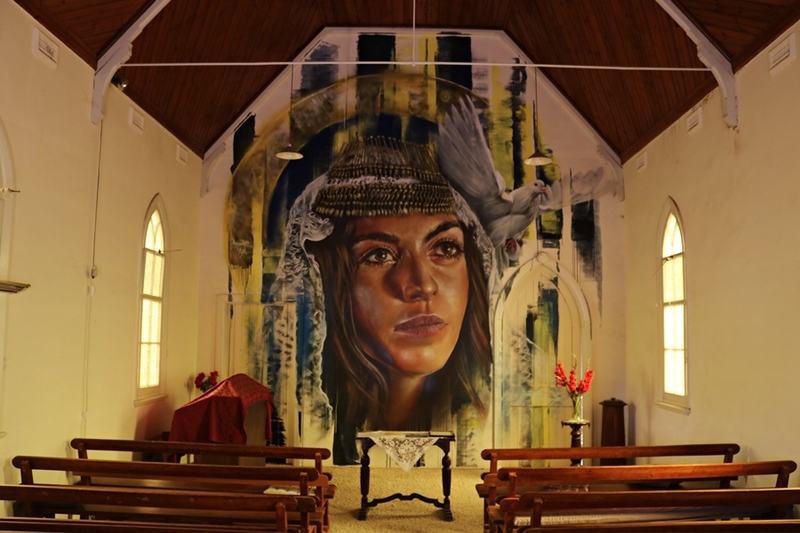 Some of them were originally from The Netherlands but live in Australia. They added a sense of authenticity to the public open day. During the rapid Japanese advance through the South West Pacific theatre of war in early 1942, Malaysia, the British stronghold of Singapore and the Dutch East Indies fell quickly. Remaining Dutch forces that could be evacuated headed for Australia, including Royal Netherlands East Indies Army Air Force (their homeland was already invaded by Germany in 1940). Four Dutch squadrons were formed in Australia and these units were integrated into the Royal Australian Air Force. The first was No. 18 (NEI) Squadron which was formed on April 4th, 1942 at RAAF Station Canberra under the operational command of RAAF No. 79 Wing. 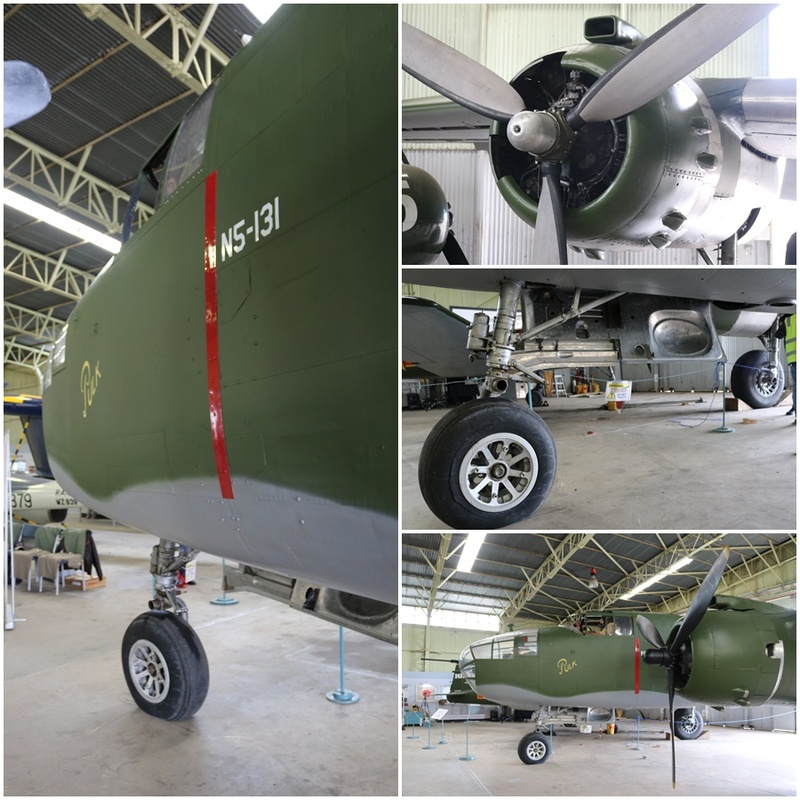 They were equipped by Dutch authorities with North American B-25 Mitchell bombers and supplies obtained under the Lend Lease program from the United States. 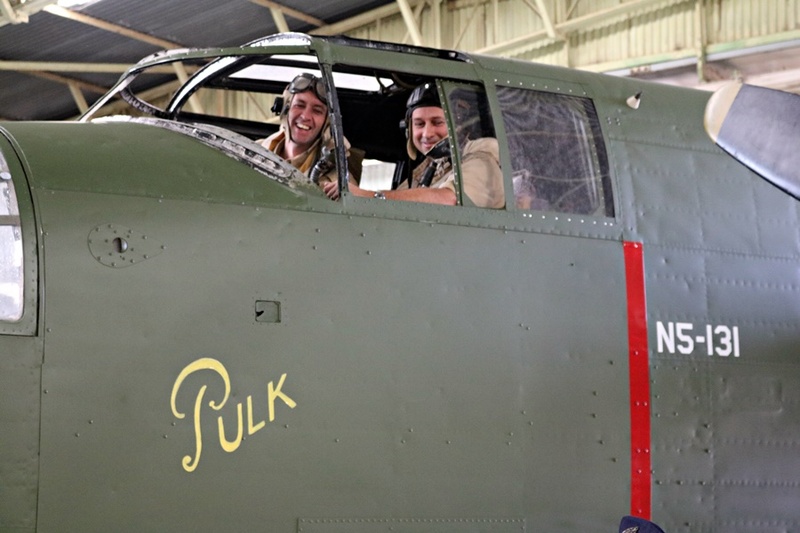 The B-25’s were captained by a Dutch pilot with the rest of the aircrew being a mix of Dutch and Australian personnel. Most of the squadrons ground crew were Australian. 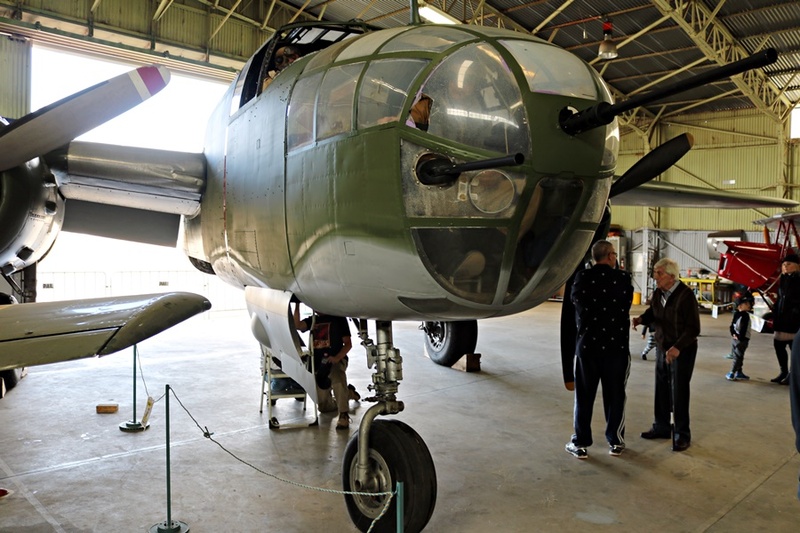 Initially the squadron conducted training and maritime patrol duties on the east coast of Australia (on June 5th, 1942 they sunk a 300 ton Japanese submarine off Sydney) until fully equipped with 18 B-25’s in September 1942. 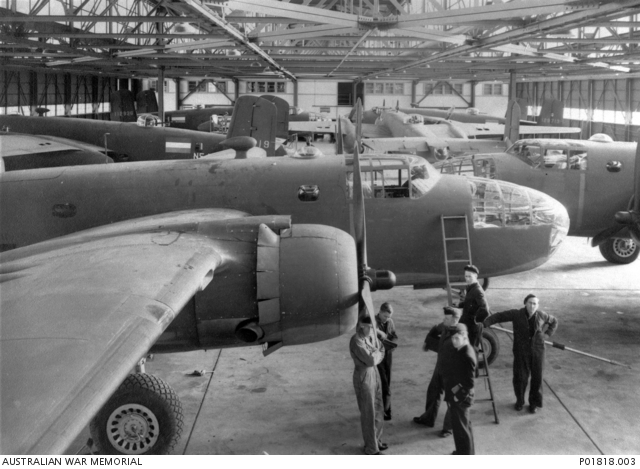 In December 1942 they transferred to MacDonald Airfield in the Northern Territory which was undeveloped site which the squadron had to work into a functioning airbase. From here they continued training flights until January 1943 when they began to conduct raids on Japanese bases and ships in the occupied Dutch East Indies – East Timor and the Tanimbar and Kai Islands. In May 1943 No. 18 (NEI) Squadron relocated to a base at Batchelor in the Northern Territory. From here they conducted reconnaissance missions, attacks on Japanese bases and low-level anti-shipping missions over the Dutch East Indies. 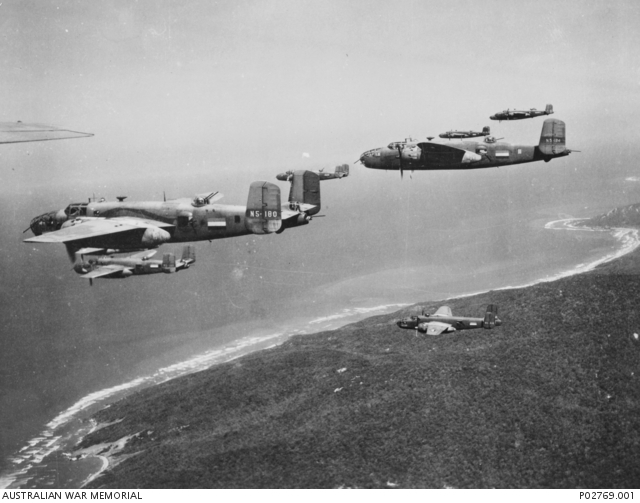 Between November 1943 and March 1944 the squadron was very busy targeting shipping that was trying to reinforce Japanese positions in north-east Papua and New Guinea. They ended up sinking 250,000 tonnes of Japanese ships, earning the squadron the nickname “the Dutch cleanser“! No. 18 (NEI) Squadron remained at Batchelor until April 1945 before beginning operations out of the Dutch East Indies (Balikpapan, Borneo). By the end of hostilities they had flown 900 sorties in their B-25’s. 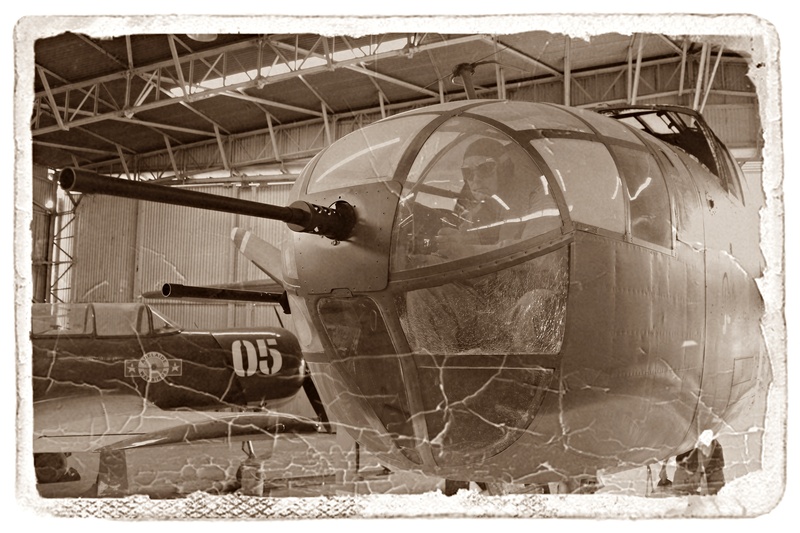 Following the end of the war the squadron became fully under Dutch control on January 15th, 1946 and would see action again flying missions against Indonesian Nationalists during the Indonesian National Revolution. Ultimately though Indonesian independence was gained and No. 18 Squadron was handed over to the Indonesians and disbanded on July 26th, 1950. 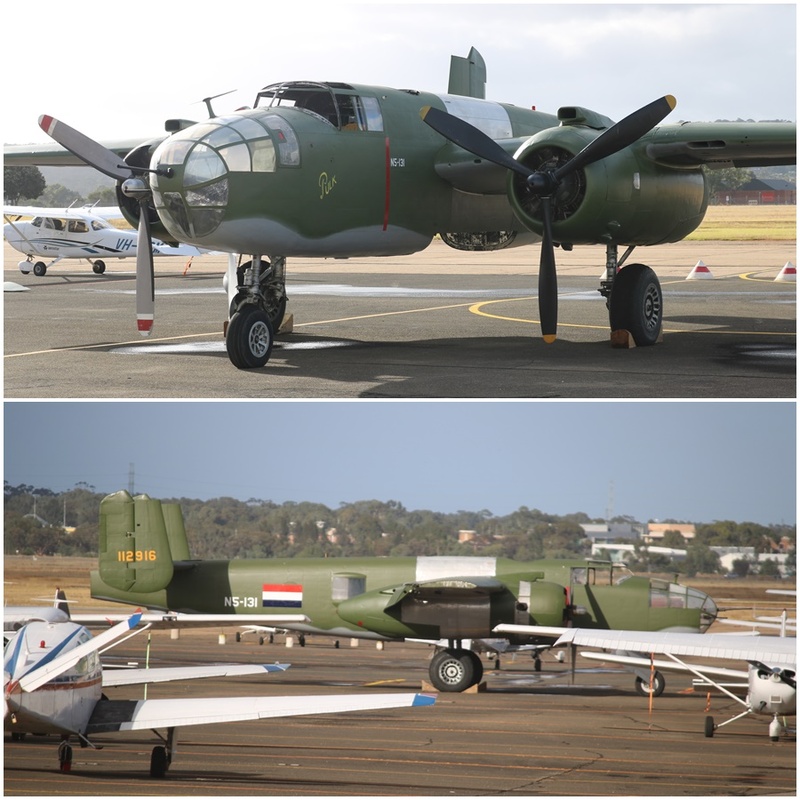 Reevers Warbirds are also returning a Douglas A-26 Invader to flight (it is already flight capable but has extensive corrosion that needs to be repaired). They also have plenty of parts to potentially start a Boeing B-17 Flying Fortress and a very rare Republic P-43 Lancer project (at the moment they are literally just a collection of parts and pieces though). 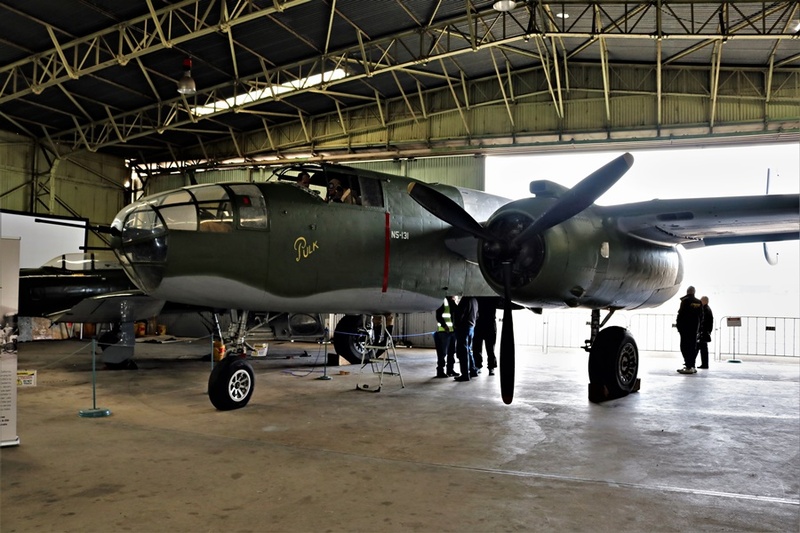 They have also recently announced the acquisition of a second B-25 that has a Pacific Theatre service record and will be restored for static display. Exciting times ahead for Reevers and the South Australian aviation scene! Marvellous restoration job! And a great compliment from the Australians to their one-time Dutch ally. thanks for posting this article about my father. Although it all happend more than a year ago, it looks like last week. I was at Reevers to paint his nickname “Pulk” on the LH side. Exactly on the 4th of april 2017, 75 years after the establishing of the 18th sqn. A little remark on your reply, my father isn’t named Frits. A mistake I read a dozen times in different articles. 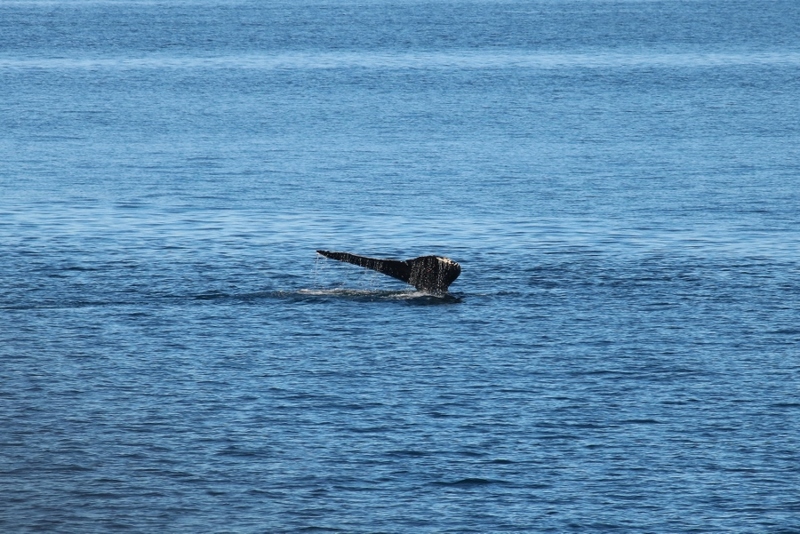 No clue why……..
You also rever to his escape on your blog. Here also he is named Frits. Would be nice to change that to Fred….. His full name was Frederik. Thanks for your comment and my excuses for this annoying error. Funny thing about that name ‘Frits’; I even found it in some official Dutch documents. But you’re the authority so I will correct my posts asap. I guess it must have been an emotional experience there at Reevers but I am glad our Aussie friends did him (and you) that honor. Hi Robert, thanks for responding and changing his name. And yes, Reevers was a very emotional happening! Glad to be a part of it. 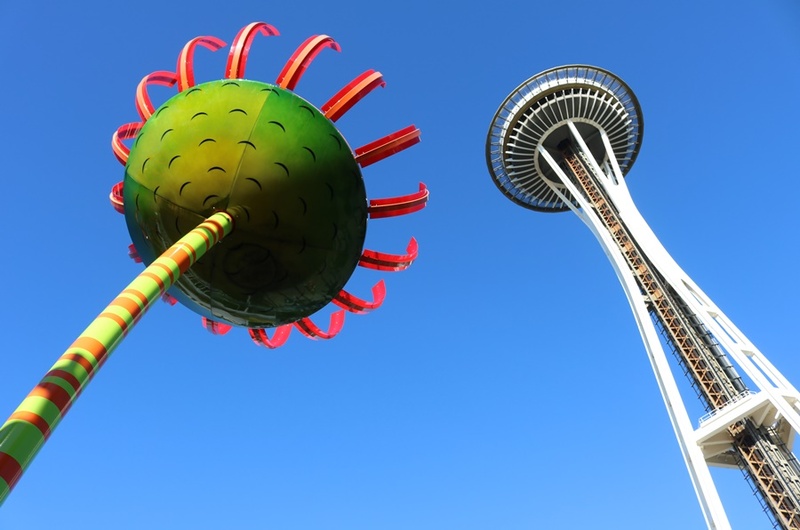 Look at this post from Aces Flying High. 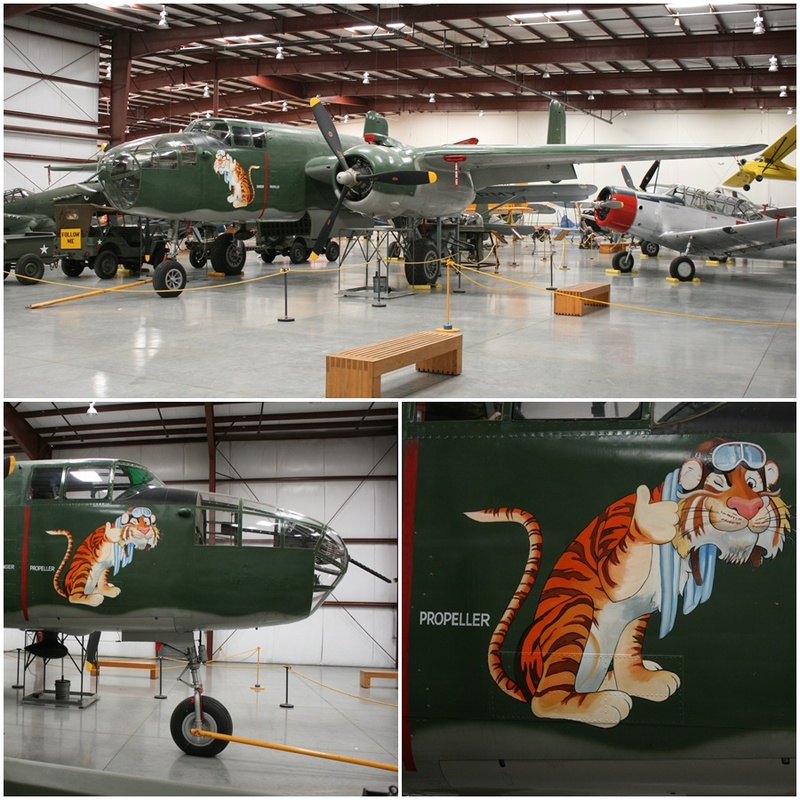 A marvelous restoration job of a B-25J and named for one the heroes in one of my posts :Fred Pelder, who managed to escape from Java in a cobbled together Lockheed 12). 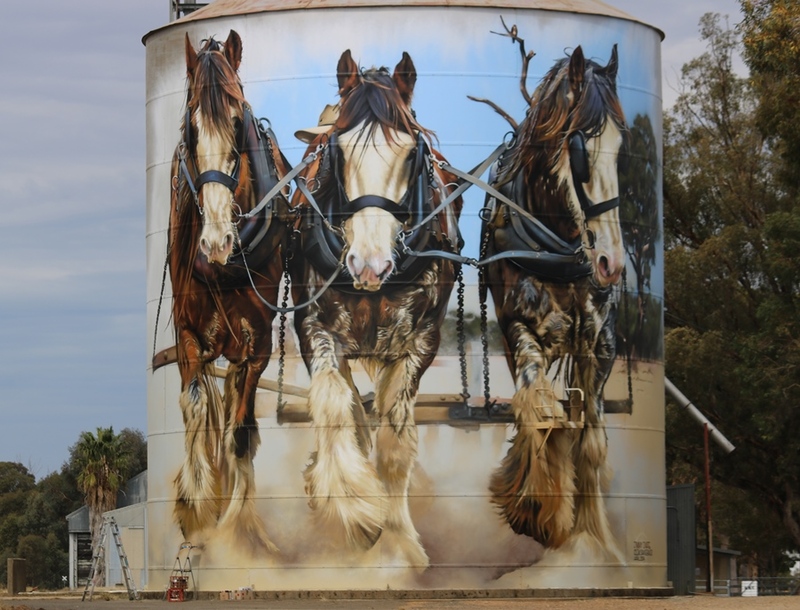 Hi Robert, just scrolling through your blogs, I am impressed! Incredable what I can find here! Great! Just saw a B-24 from the Collins foundation. Perhaps you know that they just bought the only flying PBY here in Holland. Really ashame but the rules here are so ridiculous that they had no other choice then to sell it. 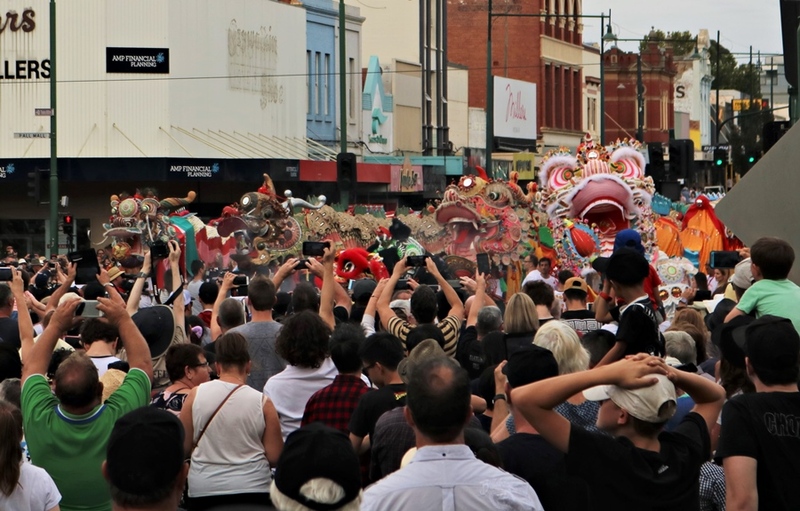 Next Post Australian International Airshow 2017 – It’s a Drone World Now!